When you choose Trane 95 furnaces, you’ll enjoy the most cost-effective performance available—and you may qualify for an energy tax credit. * Trane 95 furnaces deliver up to 96.7% efficiency, which means more of the natural gas you pay for will be converted into usable heat for your home. This AFUE (annual fuel utilization efficiency) rating is among the highest in the industry—far exceeding the federal government requirement of 78% AFUE for new furnaces. 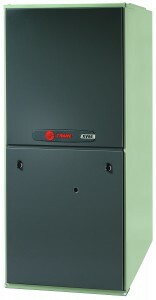 The Trane XV95 furnace is a two-stage** heating system featuring a variable-speed motor with Comfort-R™ that operates at lower, more efficient speeds than conventional blower motors and provides greater humidity control during cooling. Dual heat exchangers— primary and secondary heat—offer the greatest efficiency to capture more of the heat you pay for, and a direct vent option uses 100% fresh outdoor air for fresh air, added comfort, and longer furnace life. For more information on the benefits of Trane gas furnaces or to install a home heating system in your Minneapolis home, contact Minneapolis, MN based Ray N. Welter Heating Company at 612-825-6867. **Two-stage furnaces don’t frequently stop and start, typically running at the first stage (65% of capacity) up to 80% of the time. This provides for quieter operation and consistent, even heating since it runs longer at the lowest, energy-saving level. When more heat is needed, the second stage is called upon for added comfort. Plus, after the heating cycle, two-stage furnaces continue to run for a few moments to make sure the heat left in the exchanger is used to warm your home. *Consult your tax adviser for information on the energy tax credit.